A picture of timeless elegance, our Artemis collection offers a multitude of colour options to ensure both subtle and striking colour schemes are catered for. 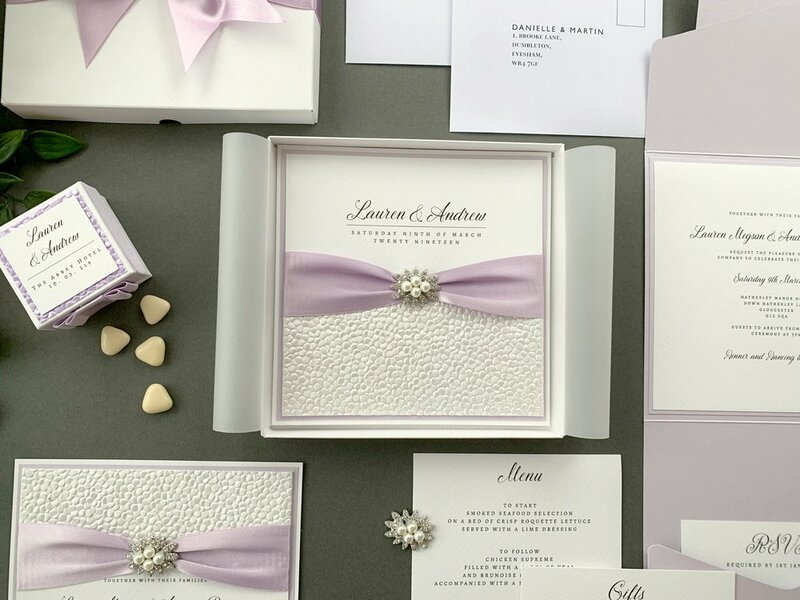 Elegant typography combines with beautiful materials, including pebble paper, which is one of our most tactile favourites. We exclusively use Berisford and Satab ribbons for our fully-handmade collections, with a huge amount of colour choices on offer and a non-fray, double-sided finish. For this design we use 35mm ribbon and the pictured colour is “Helio”. The choice of colours available can be seen by clicking below. All embellishments are shown below in their respective price bands - as standard Artemis comes priced with a Price Band A embellishment which can be upgraded to an alternative, such as the pictured “Beatrice” from Price Band C. Upgrade pricing is shown at the foot of this page. 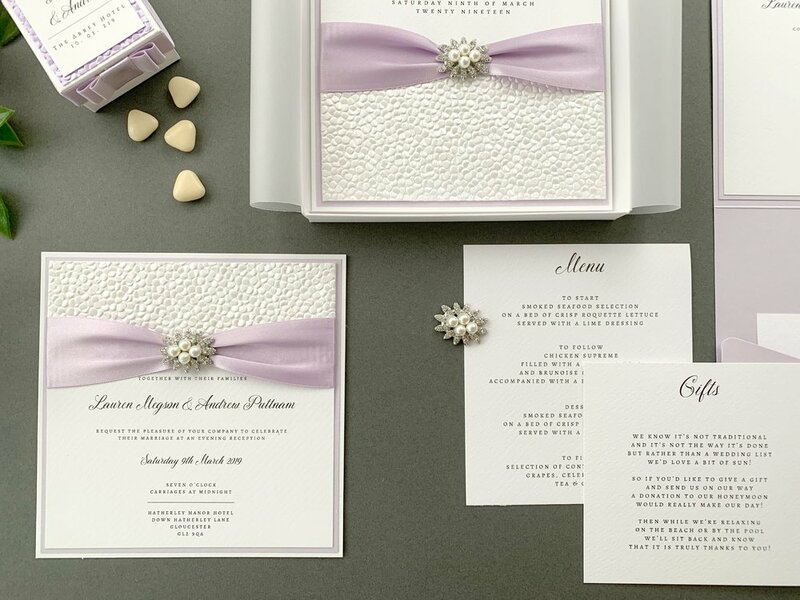 Artemis is provided as standard with a white base layer, for the folded day invitation, flat evening invitation, or pocketfold invitation. The “matting” is coloured as standard, which is the layer that sits between the base and the top. We’ve used “Lilac Pearlescent” in the pictured examples. Artemis uses gorgeous and tactile pebble paper which is available in a number of different shades to either blend or contrast with your other colour choices. We’ve used “White” in the pictured examples. Click below to see the options are available. 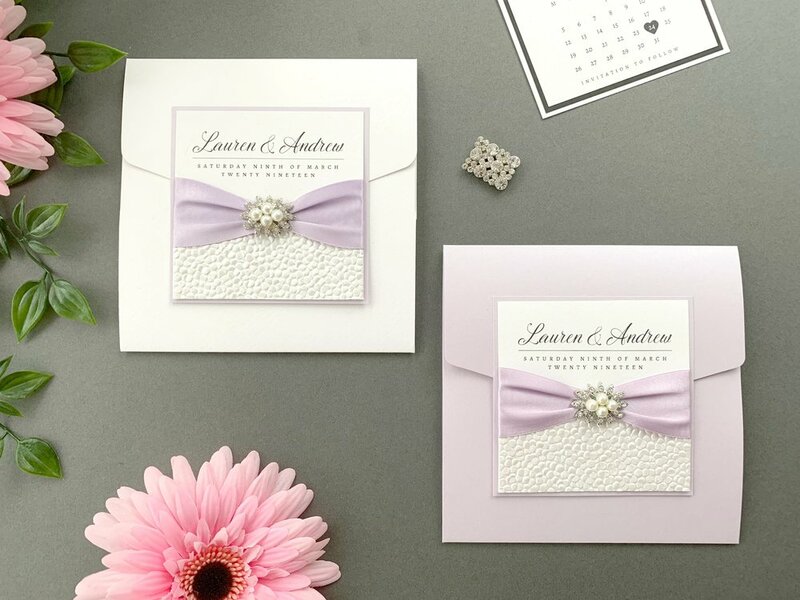 Our Artemis collection uses layers of Italian textured cardstock for its design alongside double-sided satin ribbon, pebble paper and a choice of embellishments.